A good number of New Jersey (NJ) residents are somewhat aware of the economic and environmental benefits of solar energy. They are even starting to see solar collection panels in lots of neighborhoods in their area. But a long-standing hesitation lingers with some other NJ homeowners. They’re just not sure if harnessing the sun’s power can offer enough energy to drastically reduce their electric bills and offset upfront costs. With one of the highest residential electricity rates in the country at an average of over $0.158/kWh, according to the US Energy Information Administration, NJ homeowners are turning to solar as a practical and attractive option for renewable energy production. 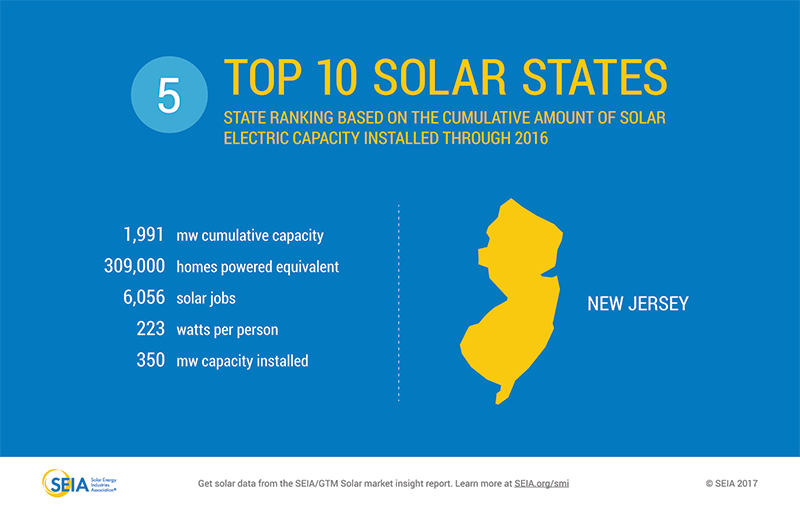 In fact, NJ is #5 in the Top Ten US Solar States with more than 2,164.2 MW installed, according to 2017 data from the Solar Energy Industries Association (SEIA). 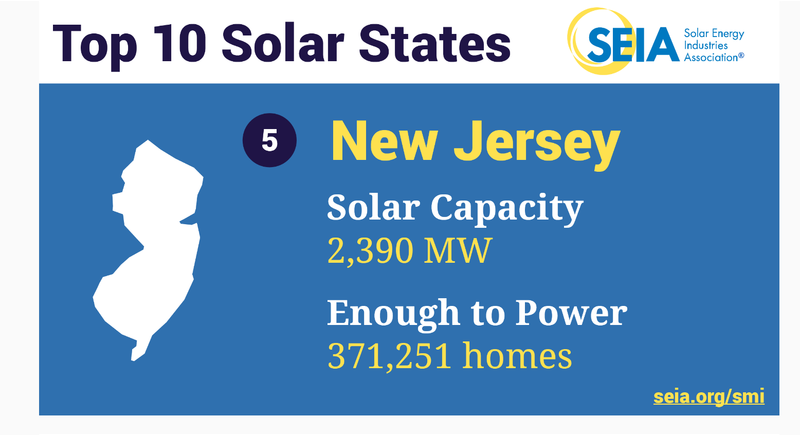 What makes solar so appealing for NJ residential electricity? Solar energy is one of the renewable energies capable of contributing significantly to energy-related environmental impacts. Global solar radiation is the most direct source and form of global energy, and it is influenced by local topography and terrain. Tilt, orientation, latitude, and climate can have major impacts on a solar system’s performance, and NJ’s topography lends itself to positive and efficient rooftop solar energy production. In fact, a residential solar system can help reduce the use of utility electricity and lower residential electric bills for NJ homeowners by 30% or even more. 2018 NJ solar costs range from $11,802 – $14,574 (6kW) and $19,670 – $24,290 (10kW). Because price paid per watt ranges from $2.71 to $3.57 and the average US household system size is 6 kW (6,000 watts), the average US gross solar panel cost is $18,840. That’s 6.5% lower than last year, and solar panel system costs are continuing to fall. NJ has lots of options of solar incentives, including multiple financial incentive programs, to make it easier for homeowners to afford the installation of a solar energy system on their home. The state’s solar success has been based on two essential programs. One is called Net Metering, which compensates a homeowner for the electricity produced, and the other is SREC NJ: Solar Renewable Energy Certificates, which rewards NJ homeowners for that electricity’s clean characteristics. And other financial incentives, too, make rooftop solar in NJ a viable option. SEIA describes Net Metering as a mechanism that allows residential and commercial customers who generate their own electricity from solar power to feed electricity they do not use back into the grid. Many states have passed net metering laws, and NJ is one. For example, a NJ residential customer may have has a rooftop solar system that generates more electricity than the home uses during daylight hours. With net metering, homeowners get a electric meter that spins forward when electricity flows from the utility into the home, but the home’s electricity meter will run backwards to provide a credit against what electricity is consumed at night — or at other periods where the home’s electricity use exceeds the system’s output. NJ customers are only billed for their net energy usage and do not water excess energy produced. A Solar Renewable Energy Credit (SREC) is created for every megawatt hour of electricity produced by a solar generator. In state markets that give the nod to SRECs, the Renewable Portfolio Standard (RPS) requires electricity suppliers to secure a portion of their electricity from solar generators — like homeowners. Solar Renewable Energy Certificates (SRECs) are credited for every megawatt-hour of solar electricity the homeowner creates. The NJ Office of Clean Energy issues clients a state certification after the system is officially interconnected with the utility. Once the state certification is provided, clients may complete their SRECTrade.com application. The SREC is sold separately from the electricity and represents the “solar” aspect of the electricity that was produced. The value of an SREC is determined by the market subject to supply and demand constraints. SRECs can be sold to electricity suppliers needing to meet their solar RPS requirement. In late 2015, Congress renewed the popular solar tax credit, which incentified thousands of homeowners to go solar, save on their power bills, and become more energy independent. The solar tax credit also had the effect of spurring on the solar industry. For 2018 and 2019, the tax credit is still in place, and it can reduce a NJ homeowner’s tax bill by 30% of the amount it costs to install solar on a home. For example, if an individual spends $20,000 on a solar system, the 30% tax credit would be $6,000. Additionally, if that person only owes $4,600 in taxes for 2018, that tax bill will be reduced to zero, with an additional $1,400 tax credit on the 2019 return. The residential solar tax credit will continue at 30% through the end of 2019 then “step down” to zero after 2022. A NJ residential solar system is 100% exempt from any sales tax, due to the photovoltaic energy sales tax exemption. That means a homeowner can deduct the 7% sales tax when considering the cost of a solar system. The NJ credit applies to all major types solar energy equipment, including equipment for passive solar design. In order to claim the exemption, the residential homeowner fills out and submits Form ST-4 (Exempt Use Certificate) to the seller instead of paying sales tax. This incentive only applies to homeowners with cash or loan purchase of a solar energy system. Eligibility continues through to 2019 and will incrementally decrease through 2021. Sometimes NJ homeowners worry that a rooftop solar system will add to their local property taxes. They have no need to fear, as NJ exempts solar energy systems that are installed to meet or offset a specific site’s electricity needs from local property taxes. This means that NJ homeowners who have invested in a solar energy system are not required to pay any additional property taxes on the added value from the solar panels. All that is required is a certificate from their local assessor which will reduce the assessed value of their property to what it would be without the solar energy system. NJ has so many incentives for residential solar that it’s hard to argue against installing one on a private residence. The state’s renewable energy targets seem to be within grasp with all NJ has done to promote solar energy adoption.